Cello Duet. Composed by Jacques Offenbach (1819-1880). Edited by Walter Lebermann. Sheet music. Edition Schott. Classical. 24 pages. Schott Music #ED6105. 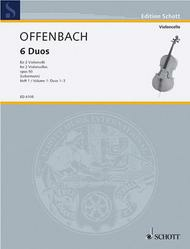 Published by Schott Music (HL.49006020).